In case anyone is wondering, this is why we are not currently doing our orientation in Shanghai. I had no idea that an otherwise healthy 27-year-old could come down with shingles. About three weeks ago, I saw a commercial on TV for the vaccine and said out loud, “Oh god! I hope I never get that!” My husband assured me that it was pretty unlikely. Turns out that it’s not all that uncommon for young adults to get this very painful, really annoying, and largely harmless condition. Stress brings it out. When I went to Urgent Care on Easter night, the doctor said that he generally sees it on young people during university exam periods. I paid my $300 (a 60% discount!) and began the healing process. Shingles is caused by the chickenpox virus. After you get chickenpox, the virus eventually goes dormant in the spinal column or base of the brain. Under stress or immune system suppression, it can come back out and wreak havoc on one side of the body. It follows nerve pathways, and without treatment can be extremely painful and leave nerve pain after the rash heals. I wanted to write out the progression for others who are my age, because I hope that they might watch out for the symptoms and seek treatment to prevent it getting worse. Step 1: Stress. Huge stress. It felt like I was back in my junior year of high school and taking a huge amount of tests, applying to colleges. Two weeks ago today I got my documents for my visa and sent it off for processing. The symptoms began almost immediately after that. Step 2: Worst headache of my life. Shooting pains all over the left side of my head, which did not get better with ibuprofen. The only thing that made the pain go down slightly was a hot rice bag applied to my forehead. The kind of rice bag normally used for muscle pain. Loud noises made it much worse. Tingles and burning sensations on only the left side of my head. Step 3: Nausea. I felt randomly ill while sitting at a coffee shop and had to go home as fast as possible. This coincided with the headache from hell, which made me think that the whole thing must just be a migraine. Stress can bring on migraines, so it seemed to make sense. I told my mom that I felt like I did when I got mono my freshman year of college. That should have been a warning. Step 4: Rash on the forehead. It started out looking like a cluster of pimples, and then they blistered. That was scary! I took ibuprofen, but the pain and swelling only went up. The pain began to wake me up at night. This is where I thought it might be a Staph infection, so I headed to Urgent Care. The doctor only needed two seconds to diagnose it, once he heard that I had neither fallen on my head nor been bitten by a dog. He prescribed antiviral pills to nuke the virus and slow it down, and said I should be better in five days. 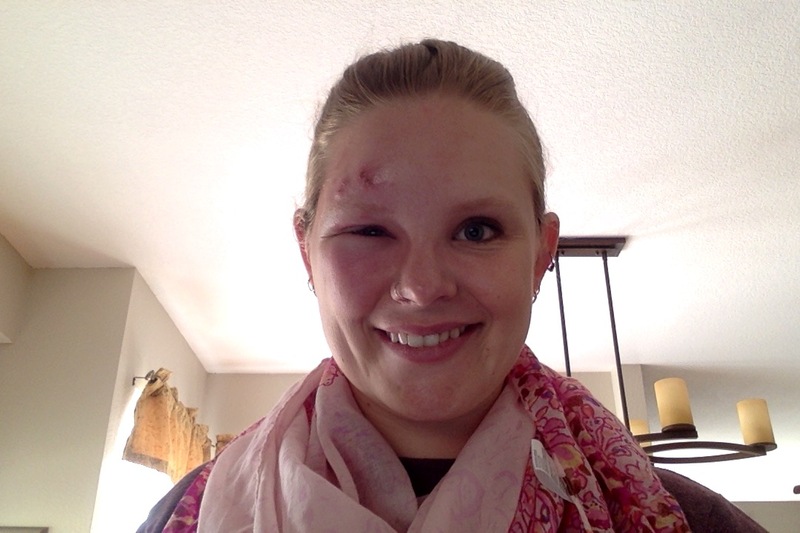 Step 5: Wake up with terrible eye swelling on the day we were to fly out to China. Freak out. Call my hiring recruiter for our job in Shanghai at 5AM. Change out flights. Step 6: Saw an ophthalmologist to confirm that my left eye is not actually at risk of losing vision. Got a cream for the rash and sent home to rest. Next week I will go back to check in. Step 7: Wait for the swelling to go down. Two weeks should be plenty of time for me to get better, and then we will go to China! If you are in your 20s and under a huge amount of stress from finals, immigration, a wedding, or work, make sure that you take care of yourself if you get unexplained pain! Antivirals only work if you catch it within 72 hours of the onset of the rash, and they don’t do much for the spots once they form. This is only a temporary setback, and we will still get to move to China. Send happy healing thoughts my way! UPDATE: This is a photo from one week after the first one was taken. 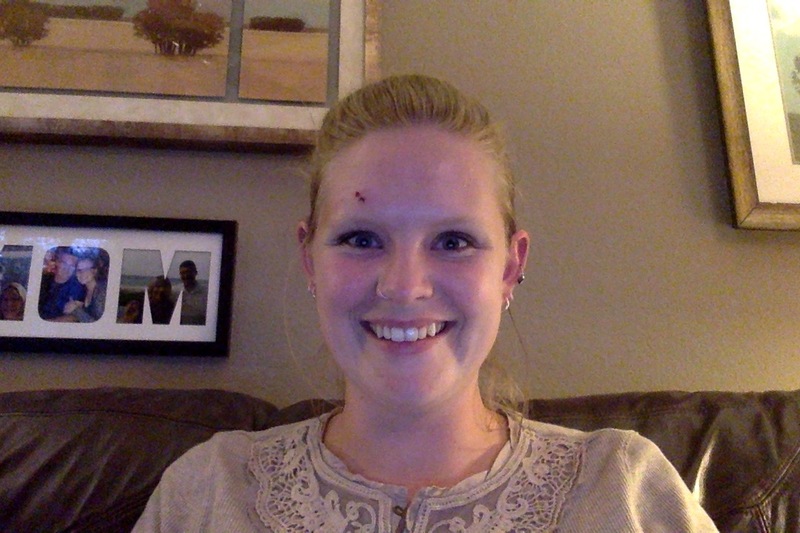 I have some seriously gross scabs falling off my forehead, but the swelling is down and I’m well on my way to recovery. Phew! I am also a normally healthy 27 year old who has shingles right now. I found your picture in Google images and clicked because it looked so similar to mine, except my eye didn’t get too swollen because my rash is further up on my forehead, so I looked like I had a giant goose egg. I just wish I were properly diagnosed the first time going to the doctor, but had to return two more times before they realized that, yes, a 27 year old can get shingles! I can definitely agree that they are stress induced. The last two weeks I’ve been taking care of my very sick 3 children and newborn baby all while my husband has been working 70 hour workweeks as a police officer. So even more unfortunate for me, I can pass chickenpox on to my newborn baby who is now sick with what my other three children had. Crossing my fingers that this horrible pain and itching will pass! I hope that you can get back on schedule for your move to China, and thanks for writing this post! Oh my god, that sounds so stressful! I’m all cured now at three weeks out, so you should start to feel much better soon!